McNeely & Lincoln Associates, Inc. (MNL) has been a trusted and respected name providing surveying services throughout the state of Michigan since 1961. MNL is also experienced in coordinating ALTA/ASCM surveys for corporate clients with national holdings throughout the United States. 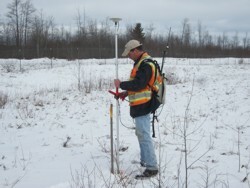 MNL employs a knowledgeable staff of professional surveyors and field crews. MNL also utilizes the latest technological tools and survey equipment, thereby providing our clients with knowledgeable personnel, precision work and the timely delivery of the final work product desired when selecting a survey firm. MNL’s staff is experienced in coordinating surveying services for general contractors, developers, engineering and architectural firms, utilities, corporate and private industries. McNeely & Lincoln Associates, Inc. looks forward to discussing with you today how we may assist in the successful completion of your current and/or future surveying needs.